Marvel's The Punisher is a 60 minute scripted crime television series, which kicked off on November 17, 2017, on Netflix and is broadcast every Friday at . The show is currently in its 2nd season. Netflix opted not to pick up Marvel's The Punisher for Season 3. Marvel's The Punisher officially canceled on Netflix. Sign up to track down your favorite TV shows. Time to Reload. Marvel's The Punisher Renewed for Season 2. Frank's just getting started and he's got more work to do. Netflix announced today that Marvel's The Punisher has been renewed for a second season. 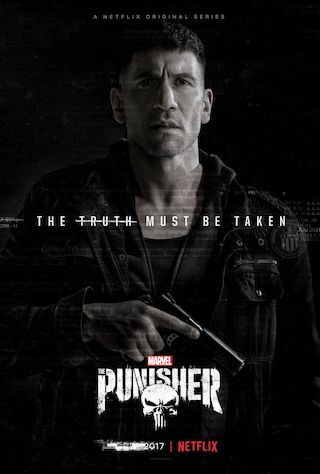 New characters will be entering Frank Castle's story, as a trio of actors have been revealed by Marvel Television and Netflix for Season 2 of "Marvel's The Punisher," with Josh Stewart (Insidious: The Last Key, Shooter), Floriana Lima (Lethal Weapon, The Family), and Giorgia Whigham (Scream, Sierra Burgess is a Loser) all joining the cast of the series. Marvel Television and Netflix have revealed two new cast members for the eagerly anticipated second season of "Marvel's The Punisher." Corbin Bernsen ("American Gods," "Psych") will play the role of Anderson Schultz, an extremely wealthy man who's grown accustomed to getting his way. His power and legacy are of prime importance, and he'll implement less-than legal means to further those ends. Annette O'Toole ("Cat People," "Smallville") has been cast as Eliza Schultz, a conniving, wealthy woman, cut from the same manipulative cloth as her husband, Anderson.